This one is so far out that even a prominent lefty "fact check" site has to call it out as being wrong. What I find interesting though is how one can fudge numbers to "kinda sorta" show something as true that is totally false. 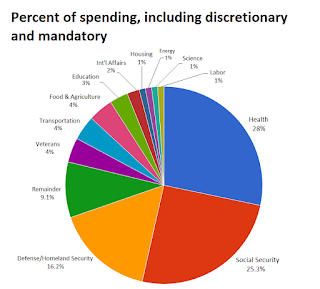 In this case, take "discretionary spending ONLY", completely ignore "mandatory" spending, plus take a few more liberties, and "wala", you have a "proof" of what many on the left want to believe anyway ... Republicans are stupid / insane / evil, there are no problems at all with massive entitlement / welfare spending, and all our problems are due to "defense spending". Our lefty media pulls this basic sleight of hand all the time ... switching between debt and deficit, using raw numbers one day, percentage of GDP another, screwing with what inflation adjustment is used (or none) ... this is THE LARGEST TAX INCREASE IN HISTORY!!!! 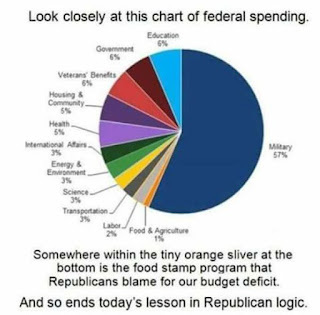 (certainly, in a country of 320 million and money worth less every year, virtually ANY tax increase (or decrease) is "the largest in history" in raw non-inflation or population adjusted numbers! 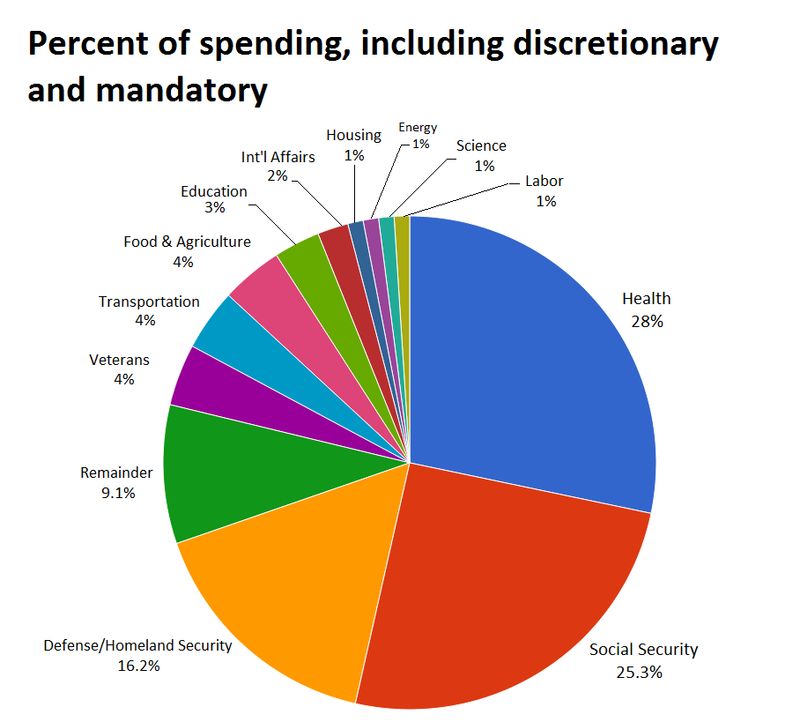 It is worth going off to the column to see just how easy it is to go from a chart that purports to show defense as some nefarious monster eating the budget, to one that at least comes close to showing the reality of entitlements consuming an ever growing percentage of our GDP. "Facts" are sticky things -- but hiding them is often not very difficult. A truly unbiased news source could do a bit more work on "remainder", "food and agriculture", "education", etc to get to the 70%+ that is now "entitlements and welfare".